Will Flutter replace React Native and Xamarin? Without knowing it, you’ve probably already used the apps made with Flutter. Whether you shopped on Alibaba, ran an ad campaign on Google Ads, or used a digital coupon, you’ve likely witnessed the results of Flutter’s still short history. The product has remained beta for a long time. Now, with its Release Preview 2 version, it finally stepped on the finish line before the initial 1.0 release. We understand the hesitation and excitement of the new, transformative technology for developers, so here’s our overview of the best and the worst of Flutter – and what you can do with it. The first question about Flutter you might have is “How is it different?” If you’re familiar with hybrid and cross-platform development, it’s valid to question how Flutter can be better than Xamarin, React Native, or Ionic, for that matter. What’s the point of switching? As we had no intention of promoting Flutter over other technologies, we decided to figure out why you should be excited about the product – and what to be wary of. Flutter is Google’s new open source technology for creating native Android and iOS apps with a single codebase. Unlike other popular solutions, Flutter is not a framework; it’s a complete SDK – software development kit – which already contains everything you will need to build cross-platform applications. This includes a rendering engine, ready-made widgets, testing and integration APIs, and command-line tools. Similar technologies such as Xamarin, React Native, Ionic, or NativeScript all try to achieve platform nativeness via different approaches. We’ve written a whole article comparing these cross-platform tools. Now, let’s see what Flutter introduces to the game. Dart is Flutter’s object-oriented language that uses Ahead-of-Time compilation techniques and compiles into native code without that additional bridge. This noticeably speeds up the app startup time. Besides, Flutter doesn’t have to call to OEM (original equipment manufacturer) widgets, because it uses its own. 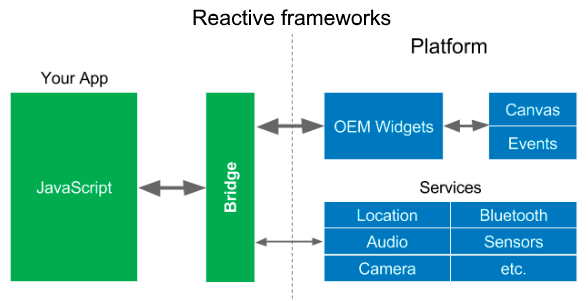 As seen on the image below, Flutter uses the OS as a canvas to build an interface on and moves services such as gestures, rendering, and animations into the framework itself, which gives developers complete control over the system. Debugging in Flutter also happens thanks to Dart. Dart Analyzer and Dart Observatory tools help find errors using specific commands. The process is explained in detail in Flutter debug docs. Another method includes using Flutter-supported IDEs and their specific debuggers. Since Flutter doesn’t use WebView it can’t be debugged directly in a browser like Ionic. React Native and NativeScript allow for testing via Chrome Developer Tools. However, considering that these products often prefer third-party solutions for debugging anyway, Flutter’s process shouldn’t appear very different. Since Flutter is a full-fledged SDK, it already offers an automated testing toolset, specifically, for three types of tests: unit test, widget test, and integration test. You can find Google’s tutorials for those tests at this link. Flutter also supports the Continuous Delivery model via fastlane, a free tool that bridges Flutter with Travis, Jenkins, or Cirrus. What’s innovative, different, and simply better executed about Flutter? Let’s review the features that will make you consider abandoning React Native for a new tool. Previously we mentioned that Flutter uses ready-made widgets. You could even say that Flutter is widgets. One of the revolutionary things about the product is how it helps create a user interface utilizing these building blocks. Compare that to other approaches that use different objects (layouts, views, controllers), when Flutter has a consistent and unified object model. Any object in Flutter is a widget, from a button to padding or a font. Widgets can be combined to create layouts, and you can choose to use widgets on any level of customization – from existing building blocks to the lowest level when you create your own widgets with the same tools the Flutter team did theirs. Widgets in Flutter are organized in trees, which is handy for rendering, but may result in an excessive complication of the whole structure. Large applications may require up to 10 layers of code to create a basic object, so you’ll have to plan the structure ahead. The fact that Flutter has its own widgets gives you one big advantage: Flutter already provides widgets that perfectly follow Material Design and Apple’s Cupertino looks. The UI customization that usually takes the longest to finish in cross-platform development takes a minimum amount of time with Flutter. Given that getting used to Dart is not a massive problem to you, learning the tool itself should be easy. The Flutter team notes that they’ve seen people with very limited programming knowledge prototyping and building apps, and also mentions that no mobile development experience is required to start with Flutter. Besides, Google is known for creating detailed and well-structured documentation, something that React Native struggles with. Apart from classic docs, you can watch video lessons from the Google team, and go through practical exercises on Codelabs. And these are just the resources provided officially. You can find courses on Udemy and Udacity, join Facebook communities, and even a study group on Slack. For such a young technology, Flutter is growing very fast. This graph shows the interest in Flutter on StackOverflow prior to the Release Preview 2 launch in comparison with other front-end frameworks. Despite still being in beta stage, the tool is production-ready which has only piqued the crowd’s interest. It’s available for commercial use and has already been successfully implemented in enterprises, medium-sized agencies, and startups. Dart is a modern object-oriented language that will remind you of Java or C++ with its syntax. It supports both strong and weak typing styles making it easy to pick up for beginners. Above, we mentioned that Dart is responsible for some of the crucial things about Flutter. Let’s analyze what about Dart’s nature makes Flutter… well, Flutter. Both AOT and JIT compilation types. In development, engineers usually have to opt for the compilation their programming language provides. Programs compiled Ahead-of-Time usually run faster because they’ve been compiled before. However, in this case, the development itself slows a lot. Just-in-Time compilation results in faster development cycles, but, predictably, affects the app startup speed since the compiler does its analyzing before code execution. 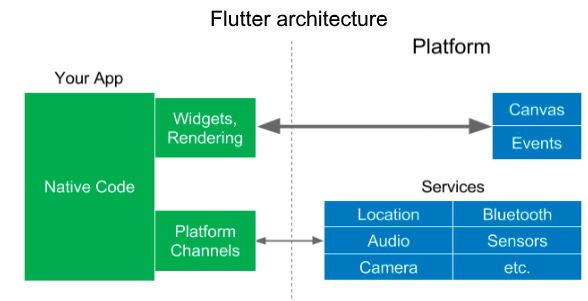 Flutter takes the best of both worlds by using JIT compilation during development and switching to AOT for app release. No need for XML files. In Android development, the work is separated into layout and code. The layout should be written in XML as Views that are then referenced in the Java code. Dart takes care of that by keeping layout and code in one place. Since everything in Flutter is a widget, the layout is also created in Dart. While we’re talking about Dart benefits, it’s worth mentioning that the language isn’t limited to mobile development – it’s also used for building web apps, and by Google no less. It’s commonly used in combination with web frameworks, AngularDart being Google’s own choice for some of its services. This tool is already engraved into Flutter’s architecture and doesn’t require any plugins to work. Hot reloading basically allows you to see updates in real time. Imagine you’ve encountered an error while running a program. In Flutter, you can fix it right away, continuing from where you left off, without restarting the whole thing. Going back to regular programming where deployment takes several minutes may be a struggle. Hot reload elevates programmers’ productivity, helps with quick iterations, and allows you to experiment without long delays. Xamarin and React Native have the equivalents of this feature too, but some reviews claim that it’s much faster in Flutter. We’ve yet to see benchmarks for proof of that. Since Flutter is not just a framework but a complete SDK, it can run on virtually any device with a screen. Third-party ports have been created to build Flutter apps for Mac OS, Windows, and Linux. They include embedding APIs, mouse and keyboard input functions, and different plugins. Some people even tried to build TV applications using Flutter. Considering the possibilities and Google’s fondness for IoT devices, it’s fair to expect that this functionality will become official in the future. Being an advocate for diversity and inclusivity, Google provides built-in opportunities to make your apps accessible to a wider range of users. Usually, when you want your app to run in different languages and be used in different regions, you need to prepare your code so it’s ready for localized content which is typically created later. This process is called internationalization. Flutter natively provides widgets based on the Dart intl package that simplifies this process. Today it supports 24 languages, but also currencies, units of measure, dates, layout options (for languages written from right to left), and more. While all this is automated, developers should also test their designs for different settings. For instance, they can use the largest font setting to see how it fits in a small mobile screen. A lot of factors go into accessing an app’s performance: CPU usage, number of requests per second, average response time, number of frames per second, and more. The Flutter team promises a constant 60fps, which is the rate at which modern screens display a smooth, clear picture. Since any lag in such a frame rate will be immediately noticed by a human eye, developers try to maintain motion at this level. To access how well Flutter pulls through, see this research comparing Flutter, Xamarin, and React Native performance. Spoiler alert: Flutter came in first with 58fps and a 220-millisecond launch time. Xamarin launched in 345 ms with 53fps and React Native came second with 57fps and 229 ms.
Just a few other practical comparisons have been made. Here, Flutter almost matched native app CPU usage, but used 50 percent more memory than React Native. Whenever we review a young or less popular technology, we notice the same set of drawbacks diminishing the product’s success. Even though cross-platform development is a new programming practice, Flutter sometimes loses in the battle with its slightly older competitors. What are the drawbacks? Third-party libraries and packages play a big part in automating software development for programmers and relieving the need to code everything from scratch. These libraries are mostly open source, easily available, and pre-tested – who wouldn’t want to try a tool that’s been used and tested in different environments before? Talking about React Native, oh boy it’s JS. We get 10+ npm modules for everything. Just type “…….. npm module” on Google and you will get more than 10 results. The main benefit of using RN is that the community of the developers is so big that, if you file an issue on GitHub, you will find someone who will create a module for you. Flutter, like any new technology, doesn’t share these numbers. Flutter’s official resource of free packages gets better every day with, its list of tools is still growing. 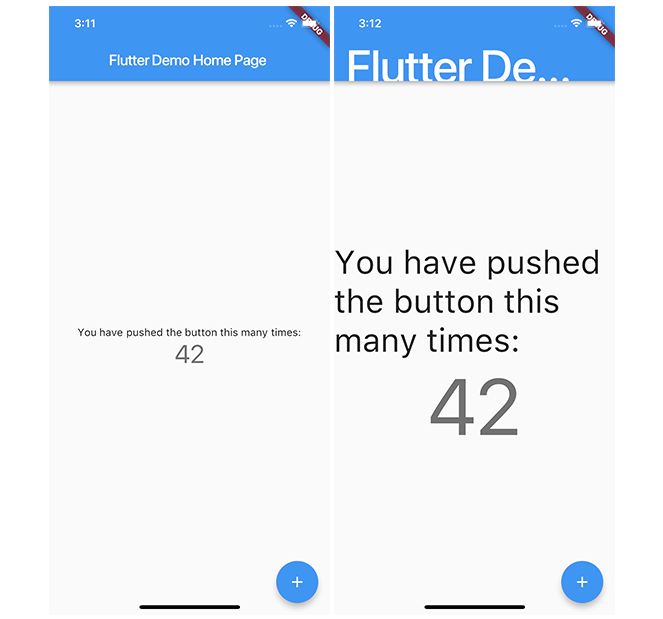 At least, Flutter takes care of your UI package needs with handy widgets, but any long-term development will probably require some waiting before the product abounds in contributed content. Developers go to great lengths to minimize the size of an app. Users have limited storage on their phones, so it’s much more preferable to release an app that won’t make them delete it in favor of precious photos or a music library. To decrease the program size, programmers tend to avoid animations, bring the number of libraries and packages to a minimum, or compress images. Flutter has greatly frustrated developers when the release file size of the Hello world app reached 6.7MB. Even after dropping to 4.7MB, it remained much bigger than native Java (539KB) and Kotlin (550KB) apps – and that’s for the bare minimum app. Although, to be fair, its competitors share the same problem, and probably even more so – the release version in Xamarin will take almost 16MB and 7MB in React Native. Since Flutter is developed by Google, developers are rightfully worried about its implementation for iOS. There’s no doubt that building Android apps on Flutter is fast and enjoyable since Google is directly interested in fixing bugs in the shortest amount of time. But what about Apple devices? One of the biggest updates in Flutter’s Release Preview 2 included a pixel-perfect iOS look. The team illustrated the possibilities of Cupertino widgets by recreating iPhone settings on Flutter. However, until recently, design features weren’t up to date and followed iOS 10 features while iOS 11 had already been live for months. It’s unclear yet if updates will keep coming as fast as Android’s version when the product will finally leave the beta phase. So, we’ve reviewed Flutter’s main features, dropped in some comparison with other products, and hopefully helped you form your own opinion about the technology. Now, how do you get started with Flutter? Check your system requirements. Windows users must have Windows 7 SP1 or later (64-bit) with Windows PowerShell 5.0 and Git for Windows pre-installed. Mac OS developers need a 64-bit version with Xcode 9.0 or newer installed while Linux users don’t have to comply with any special requirements. Download Flutter SDK. Choose your OS and follow the instructions. All operating systems support development both for iOS and Android, but you will also require a platform-specific editor. Dart comes pre-installed with Flutter. Install an editor. You can use any IDE with Flutter command lines, but Google recommends using their plugins for officially supported editors: Android Studio, IntelliJ, and Visual Studio. Long answer: Should it? Considering the rate at which we’re improving our programming habits, it’s fair to expect a new Flutter to appear on the horizon in a few years. This doesn’t mean that any older technologies become obsolete, it just gives us more options and opens new possibilities. Team. If you have in-house developers, will they gladly learn Dart and embark on creating apps differently than they did before? If you want to hire an outsource team, is there one with Flutter experience? If you’re looking to create your own development expertise, is there enough Dart/Flutter talent on the market? Time limit. Does your team have time in between their project tasks to learn Dart/Flutter? How time-sensitive is your project? Scope. How big a project do you have? Is it complex and long-term? Or is it an MVP that will bring minimum losses in case of failure? Hopefully, this article answered most of your Flutter questions. Let us know what new technology you’d like to read about next in our series The Good and the Bad.